Have you been avoiding the department store because you thought it was just too expensive? Well, there are actually some occasions when it's usually cheaper to shop at a department store than anywhere else. 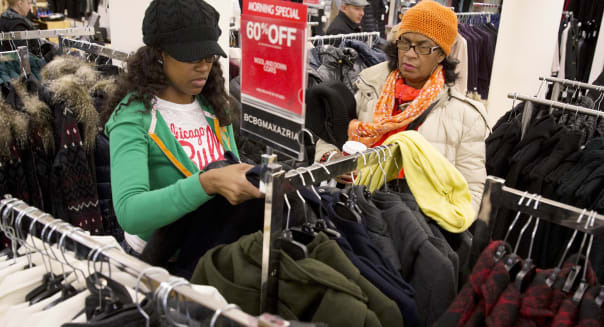 Consider these times when department store shopping actually makes financial sense. 1. Bedding and towels. If you want your sheets and towels to last through multiple washes and still feel comfortable, then it's important to buy high quality items -- such as the ones at your department store. Clip coupons, buy during online sales or take advantage of end-of-season clearance specials to score the best deals. With these discounts, the prices will be similar to those of discount stores such as Target (TGT) or Walmart (WMT), but the quality will typically be better and the items will last much longer. 2. Appliances and electronics. Purchasing appliances at your favorite department store, such as Sears (SHLD), may save you more money, include free shipping, and have the store's warranty and guarantee behind them. Macy's (M) has also teamed with Best Buy (BBY) to offer some of the best electronics deals and selections, beginning in November. 3. Perfume, makeup and cosmetics. The department store perfume counters may be annoying with their incessant, unwanted spraying and sales pitches. However, they really do offer some of the best deals around on your favorite designer perfumes, makeup and cosmetics. Along with the discounted pricing and bundle offers, they will also commonly have promotions throughout the year, such as free lipstick if you make a perfume purchase. You can also get tons of free samples anytime you visit the perfume or makeup counter at the department store. You can also find lotions, acne products and anti-aging solutions behind the counter at your favorite department store. Along with the free samples and promotional items you receive with your purchase, you can also get free professional advice from the counter person. They may even be able to offer advice and assistance with applying the makeup you're purchasing. 4. Items you need a stylist for. Did you know that most big department stores offer personal stylist services? For instance, Nordstrom, J.Crew, Macy's, Saks Fifth Avenue and many other department stores offer personal stylist services, wedding services, custom home services and other visitor services, usually by appointment and free of charge. If you have a big event coming up, then these free services can be highly beneficial. A professional's recommendation and assistance can help you make the perfect purchase, backed by a return policy in case you're not completely satisfied. 5. Sale and presale items. Most stores offer sales frequently, at least once a month. While you can save money on particular items at any time during the year, nothing beats certain sales, like Black Friday, when you can save big money on nearly anything. That's because nowadays, sale items are marked up so much at regular price that the sale price isn't that great anymore. When sale items just aren't enough, consider presales, early access sales and anniversary sales. There, you'll have first dibs on sales items, so you'll have access to the best selection and prices available. If you find a clothing item at a department store that you can't live without, wait for a sale. It usually takes about six to eight weeks for an item to go on sale, so ask an associate how long it's been on the floor and if there are any upcoming sales. Men's suits also go on sale twice a year, so you can get a top-quality suit in any size that will last you for years to come, at about 50 percent off. 6. Items you can negotiate. Many shoppers have luck negotiating for lower prices at big brand name stores like Sears, Macy's, Kohl's (KSS) and JCPenney (JCP). Often, simply asking for a discount or price adjustment will result in saving money on auto parts, furniture, electronics and even home appliances. The more expensive the item is, the better luck you will have of negotiating a better deal. The salespeople are often working on a commission or simply want to make a sale, so there may be some wiggle room when it comes to the price. You will also likely have better luck negotiating towards the end of the month, as this is usually when inventory needs to be moved out. If you are interested in an older model appliance, the store will probably be eager to discount the old model to make room for a newer one. If you have found the same item for a lower price elsewhere, try negotiating for a match or better deal. It never hurts to politely ask for a discount that could end up saving you big money in the end. Shopping at a department store has its perks, like occasional sales, a high-quality selection and impressive return and exchange policies. You can rest easy when you shop at a department store knowing that you will be satisfied with the items and are getting your money's worth. The same can't be said for outlet and dollar store items. Fortunately, there are a number of other ways to save at your favorite department store, regardless of what you may be buying. 1. Start at the back of the store. When a department store wants you to purchase a specific item, they will make sure that it is within your eyesight. That means items in the front of the store, in front of the rack and in your direct eye line are probably the most expensive options or the items that the store is trying to push for some reason. Make sure to look at the top and bottom shelf, towards the back of the store and in the back of the clothing racks to find hidden gems (and sales). 2. Use coupons. Department stores offer coupons all the time. Search online or use sites like RetailMeNot or Coupon Sherpa to find printable coupons that can save you even more on regular and sale items. 3. Join reward programs. You can enjoy added savings and discounts by signing up for the store's loyalty program, where you can earn rewards every time you shop. 5. Know when to buy things. Be sure to check Wise Bread's Buying Calendar to learn when and how to buy just about anything to save more money throughout the year. 6. Feel free to return things. If you don't like something, return it. Don't let it wither away in your closet or let it take up space in your home or garage. If buyer's remorse sets in, department stores offer great return policies. Simply return it and get your money back. What do you always purchase at department stores? Please share your thoughts in the comments!